Look's like an interesting read, I'll have to get a copy myself. Amazon has mixed review on the issue, but there are only 2. 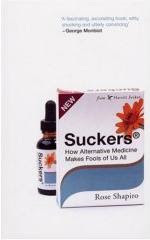 Remember, traditional/Western medicine can also make fools of us. Mr. Dan Abshear joined the GNIF Brain Blogger writing team earlier this month. He recently divorced himself from "big pharma" and now reveals the corruption involved with drug development, research, and approval in order to get to our medicine cabinets. Thank you. I have nothing against alternative medicine, but my problem is that many people who practice holistic medicine do so in replacement of Western therapies, rather than in conjunction. There is nothing quite so frustrating as trying to convince someone that vitamin C will not remove cholesterol from arterial walls as well as lipitor. Careful, Shaheen. Beware of specious reasoning. The fact that aspects of conventional medicine are flawed is not evidence that the claims of alternative medicine are valid. To the scientist, each proposal must stand or fall on the data, not on "guilt by association." Oh yes, and a question, if you do not mind. Why is it that in Asia and Africa the more developed nations are abandoning traditional medical practices (herbalism. acupuncture, Vedantic medicine, etc.) in exchange for Western style medicine, and enjoying reduced rates of disease and early death when they do? Why has the health and lifespan of people in countries that move to Western medicine improved so much, while those that continue to use traditional health practices fail to enjoy those improvements? The reason that we in the West can enjoy the luxury of dabbling in metaphysical speculation in the guise of medicine (which is what most of complementary medicine is) is that traditional, Western medicine has improved our health to the point that we can be stupid with impunity. Usually. Best wishes for you good health! This is an interesting article on alternative medicine, which makes fools of us all and its a big issue now a days. I think "If Heath is Wealth, then everything is good."